Brian Abrams was kind enough to send over his latest Kindle Single, "Die Hard: An Oral History." It's quite short (should take you an hour to read, maybe less) and filled with interesting tidbits (like producer Joel Silver putting steak and lobster on the craft services table since everyone was working long hours and he wanted their energy and attention) and with those little moments that make oral histories so entertaining (like writers, stunt coordinators, and producers disagreeing on who actually came up with the title Die Hard). This is not what grabbed my interest, however. I was on the lookout for nuggets that could help settle the great mystery of our time: Is Die Hard a Christmas movie? The answer, for reasons laid out here and here, is obviously no. Briefly, though, the case against Die Hard being a Christmas movie is simple: Christmas is not intrinsic to the film in any way, so it's not a Christmas movie. Period. Yet simpletons persist in saying that because it's set during Christmastime and the majority of the action takes place during a Christmas party, hey, it must be a "Christmas movie." They'll often point to the music that concludes the film, "Let It Snow," as definitive proof. It's a Christmas movie! Right? You know the music at the end of the movie? "Let it Snow." That was dubbing. I didn’t even know they were going to put that in. My assistant [Derek Brechin] just made a mix before the boys finished putting sound and music to the last reel. It was in there as a joke, but, when that song came up, every executive that was at the screening jumped up screaming, "It’s a hit!" I’ll never forget it. It stayed. It stuck. A joke that stuck around because it tested well. 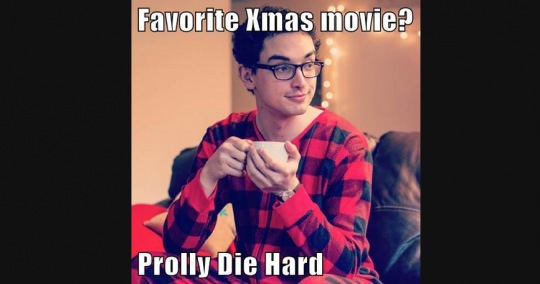 Yeah, sure, that means Die Hard is totes a Christmas movie. We call that huge group of people "mental invalids," Mr. Davi. Frankly, I think holding this opinion should be grounds for stripping the franchise from voters; they're clearly not suited to make rational decisions. But what do I know. Anyway, I'm glad we settled that renowned summer blockbuster Die Hard—which came out 28 years ago next month, in July, a date that is just about as far from Christmas as you can get—is not a Christmas movie.